SMAD2 from other species may also be detectable. 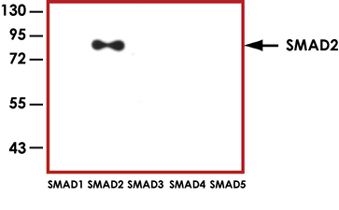 Sample Data :Representative Western blot with Anti-SMAD2 (1:1000) using 15ng of GST-tagged human recombinant SMAD1, SMAD2, SMAD3, SAMD4 and SMAD5. 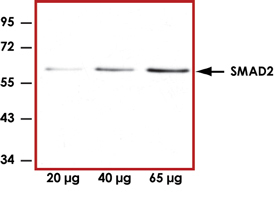 Sample Data :Representative Western blot with Anti-SMAD2 (1:500) using 20 μg, 40 μg and 65 μg of Jurkat cell lysate. Scientific Background :SMADs are essential intracellular components for the signal transduction of TGFβ family members. SMAD2 is an intracellular mediator of TGFβ family and activin type 1 receptor (1). SMAD2 mediate TGFβ signaling to regulate cell growth and differentiation. SMAD2 is released from cytoplasmic retention by TGFβ receptor-mediated phosphorylation. The phosphorylated SMAD2 then forms a heterodimeric complex with SMAD4, and this complex translocates from cytoplasm into nucleus. By interacting with DNA-binding proteins, SMAD2 complexes then positively or negatively regulate the transcription of target genes. Inactivating mutations in SMAD2 have been found in various cancers (2). 1. Masayuki, F. et al: Identification and Characterization of Constitutively Active Smad2 Mutants: Evaluation of Formation of Smad Complex and Subcellular Distribution. Molecular Endocrinol. 2000; 14 (10): 1583-1591. 2. Eppert, K. et al: MADR2 maps to 18q21 and encodes a TGF-beta-regulated MAD-related protein that is functionally mutated in colorectal carcinoma. Cell. 1996; 86: 543-552.